Amazing Adventures: I will not "Light it up blue"
I will not "Light it up blue"
It must be nearly April, because my news feed is littered with calls for people to "Light it up blue for Autism Awareness". To be honest, it makes me cringe. There is heaps of "Autism Awareness" going around. It's what causes students at my kids school to "joke" and "tease" by saying things like.... 'don't do that, it makes you look Autistic'. No. 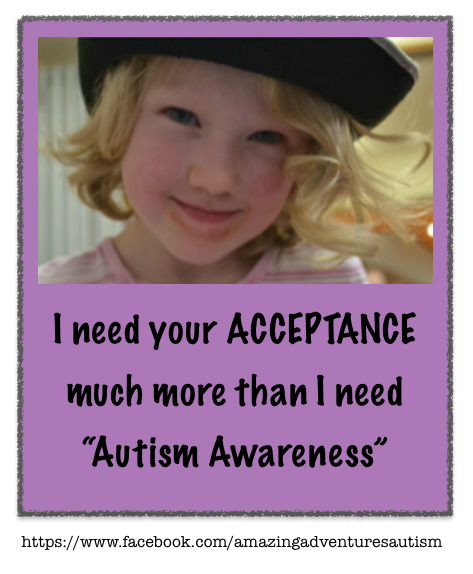 My kids don't need #AutismAwareness- they need #AutismAcceptance. Accpetance is different than awareness. Acceptance means that everyone is worthwhile, no-ones neurology is made fun of, and everyone gets the support they need without having to fight legislators to provide it. This April I'll be advocating for Acceptance. I won't be supporting the Autism Speaks driven light it up blue campaign that raises them money to research to find a cure. I won't be buying a Build-a-bear blue bear so they can give money to Autism Speaks or Autism Awareness Australia either. Here in Australia, many people have heard of Autism Speaks, but feel we are removed from their influence and do not need to weigh in on the stand against them. I disagree. For two reasons. 1. I do not want AS to assume that because Australians are not speaking up against them that they are welcome here. 2. We already have our own Autism Speaks here, in the form of Autism Awareness Australia. Australians, please do not be fooled into thinking that we are safe from the Autism Speaks message here. Image is of a young Autistic girl with blond hair wearing a hat and smiling. I need your ACCEPTANCE much more than I need "Autism Awareness"
I will not support an organisation that sends out the exact same message Autism Speaks does. I will not change my mind about supporting Autism Awareness Australia until this message from them changes. Not even if you point out that they are doing a few good things along the way. The harm their message does to my children is real. The damage their message causes to the possibility people will accept my children as valuable the way they are is immeasurable. "When I am open about being Autistic, I am handing people a weapon to punish me with. This was not the first time that my autism has been invoked during a disagreement. I have ended up leaving so many communities because I was told that I was only disagreeing because my autism meant I didn’t really understand. I have been told I am having an unreasonable meltdown when I am calm and polite but the other person is agitated and using curse words. Anytime someone wants to dismiss my opinion or experience, they point out that I am Autistic, as if that trumps anything and everything. They remind everyone that I am not reliable, that my word means nothing, that I don’t understand anything. "Telling people that I am Autistic gives them the opportunity to understand me better. It also gives them the opportunity to dismiss anything and everything about me as irrelevant, deluded, pathological, unacceptable. No one has to provide a logical counter for anything I say because my words are Autistic words so they mean nothing. They are merely symptoms and can be disregarded." Really think about it- how would you feel if we took a month of the year to promote that everyone be aware of you and the fact you need fixing???? Then let's change the message. My kids don't need curing. They don't need fixing. They don't need changing. It is society that needs to change, and Acceptance of all is the key. Note: this article has been republished at The Huffington Post. Click here to view. 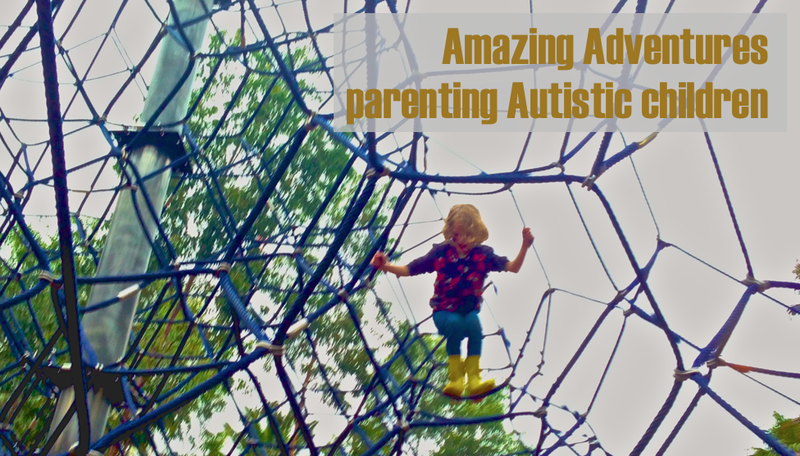 "My kids don't need #AutismAwareness- they need #AutismAcceptance." But People will not accept if they are not aware. Kids are different, they really dont understand. Adults will say "You're kids a brat" (Assuming the kid is the type to get upset easily and have a melt down) if they arent aware. When they are aware, they can make the decision to, hopefully, accept. While I am advocating for acceptance people will still become aware. Advocating awareness does not help encourage acceptance. I believe anyone who is happy to settle for awareness without actively pushing for acceptance is doing the Autistic community a disservice. Advocacy is educating others as much as making sure your child's rights are respected. The population is 'aware' of autism existence already, we must educate the younger generation for more acceptance of autistic kids. I don't see that happening in our Australian mainstream school. When I asked explicitly if there is any plan for this in our school (about 50-60 kids w autism enrolled w SEP assistance), I was told talking about autism will cause bullying. So the autistic kids will just be bullied because they are different and 'strange' in the meantime.. I may have lost my comment? Am from Australia too, would live to connect. Hi! Your comment was there, just was waiting for moderation :-) If you are on Facebook drop in to my page and leave me a message.... easiest way to get in touch. While I agree with you that acceptance is more important than awareness, there are cases where acceptance isn't enough. Most children with autism need acceptance more than change but for some a medical cure, if it could be found, would be preferable to years of full time therapy aimed at getting a child just to be able to communicate with family. People with autism who are able to go out in the world on their own need acceptance. People with profound autism whose communication skills might not ever surpass that of a 1 or 2 year old need more than acceptance. I wonder on whose behalf you are speaking here? Regardless, I know many who would disagree with you. Including Amy- a non speaking Autistic adult. Here is a quote from her in response to someone advocating that Autism needs curing and a "National Action Plan" Keep in mind that Amy is unable physically to care for herself or to use verbal language to communicate. "Your words hurt me. I am an Autistic adult, yes, I have epilepsy, but this is not autism; yes I have GI problems, but this is not Autism. My family is living, happily and proud of me. I am non-speaking and I am living. I am not lost. The difference is that you cannot love autistics for who they are, so you attack us. Why did you create an organization that spread fear of and hate for autistics? Why don't you talk to us, or better, listen to us? Your words are full of viciousness. My family sees the sun shine and they see me. They encourage me to be the best I can be and I learn every day. I cannot eat by myself, dress myself, I am not safe by myself but I have plans and I will have a future because my community has my back." Lastly, I'd like to say that my son and daughter will need a lot of support to do what you would call going "out in the world on their own". By that I mean, it will look to many like they are doing it on their own, but he they not be.... their father, family and I will be providing them a lot of support and help, just as Amy, who you would label "with profound Autism", needs. Your assumptions about Autism and it's levels of severity are inaccurate- another issue you would do well to listen to Autistic people on. My daughter is 3, non-verbal, self-injurious, and autistic. She does NOT need a cure. She needs acceptance. I would never want to change who she is. Yes, I would like for the self-injurious behavior to stop and for her to learn a different way to express herself. However, that is learning. That is not changing who she is. I am so proud of my daughter because she is an amazing, strong-willed, extremely loving, and hard-working person. Why would anyone want to change someone with such beautiful qualities. Yes, I send her to therapies. However, I do not send her for a cure. I send her to therapies for the same reason I send my older son to school; to learn. Everyone deserves acceptance, regardless of their backstory. Thank you, Anonymous, and also Michelle! Learning is not curing. I am not yet fully independent alone in the world, and hope I don't have to be, ever. When I was younger, I was nowhere near as successful at things as I am now. I am Autistic, and also a professor, even though I am what you might charitably call a 'late bloomer.' :) Michelle's friend Amy is also my friend. Being forty-something, I grew up in a time before "Autism Awareness." My mother says this is a blessing. "I don't know how families cope with all this horrible awareness stuff these days," she says, and I gratefully agree. Thank you Michelle, Anonymous, and Ibby. I have a lot of supports, including government disability benefits and a regular support worker as well as some close friends and a boyfriend. I am not "out in the world on my own" and the times when I have been were times I was living in the streets and eating from dumpsters because I don't have sufficient self-care skills to be completely independent. But I don't want someone to cure me because even though they might be able to remove my struggles, they could only accomplish it by erasing my whole brain and starting over from scratch and I like my brain. I like it a LOT. And it's scary to me when people talk about curing my beautiful brain. Because it sounds like talk of killing me. I get angry when people say they don't vaccinate their children because they are afraid of autism because they are saying that they would rather their kid die from a preventable disease than turn out like me. That's what "awareness" gets us. I can't visit someone very dear to me in their own home because they live with their mother who is "aware" of autism and as a result is afraid to let me in her home because she thinks I will be like the Sandy Hook killer. That is awareness without acceptance. Awareness without acceptance means there are people who will stand in my way to block me from achieving the things that would enhance my life and my happiness because they are afraid of me or judge me harshly without ever having met me. I do not want awareness without acceptance and I do not want a cure for who I am. I want people to open their hearts and minds to me and others like me because we are good people, loyal and loving people, and we have a lot to offer society whenever society decides that it's ready to recognize our shared humanity and fully accept us as members of the whole. "30,000 Aussie people have been silenced and disenfranchised, by Autism Awareness Australia." @ AU93: Autism Acceptance will more successfully lead to people understanding meltdowns and the possible causes of them. All Autism Awareness will cause is "Your kid's a brat" becoming "Your kid's a brat and you're just using Autism as an excuse." Simples!